CHIMINEA, FIRE PITS AND ACCESSORIES > Chiminea Accessories > The Milano Chiminea Stand! Do you have a chiminea but need just the stand? Or would you just like an Upgraded more Ornate Stand? 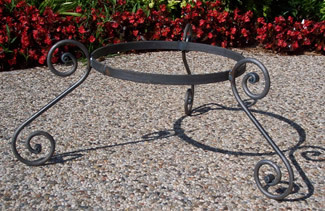 Our Milano Chiminea stand is Custom made with hand forged scrolls. We Offer the Milano in any size stand you many need. The footprint is wide enought that it gives the stand great stability for heavier pots or chimineas. The Scolls are hand forged and then mig welded to 1/4" by 1" solid steel stock.